I spotted what apparently was a father and daughter riding tandem on a foldable bicycle along Katipunan and heading to the University of the Philippines campus in Diliman. Both were dressed quite appropriately for the weather and for cycling. It was good to see that they both at least have their helmets on; though ideally it would have been better if they wore elbow and knee pads and “reflective” clothing for them to be easily seen on the road. Waiting for a chance to cross – the cyclist was waiting for a chance to cross Katipunan towards the University of the Philippines’ Magsaysay gate. True to form, motorists along Katipunan’s southbound directions do not slow down to allow for others to make a left turn to UP. Motorists bound for the university have to inch their way and create gaps for themselves to cross. Often, one has to rely on the Katipunan jeepneys whose drivers are braver than others in forcing their way to be able to cross the road. The father and daughter tandem were able to cross safely, taking advantage of a screen of motor vehicles (including ours) that made a left turn to enter UP. I have observed that jeepney and truck drivers are more likely to stop and give way than private car drivers and motorcyclists. Motorists generally don’t give way to others even in heavy traffic, often blocking intersections just because the green light is still on for them. Many do not give way to pedestrians and do not know how to share road space with cyclists. Worse are motorcyclists who use sidewalks and bully pedestrians to give way to them! Meanwhile, you have pedestrians who throw all caution to the wind to cross anywhere and anytime along roads like Commonwealth, commuters occupying the carriageway as they wait for their rides, and cyclists hogging the middle of the road when there are actually lanes designated for them. These are manifestations of how poorly people are trained for road use and often an indictment of a failed licensing system as well as traffic education in general. 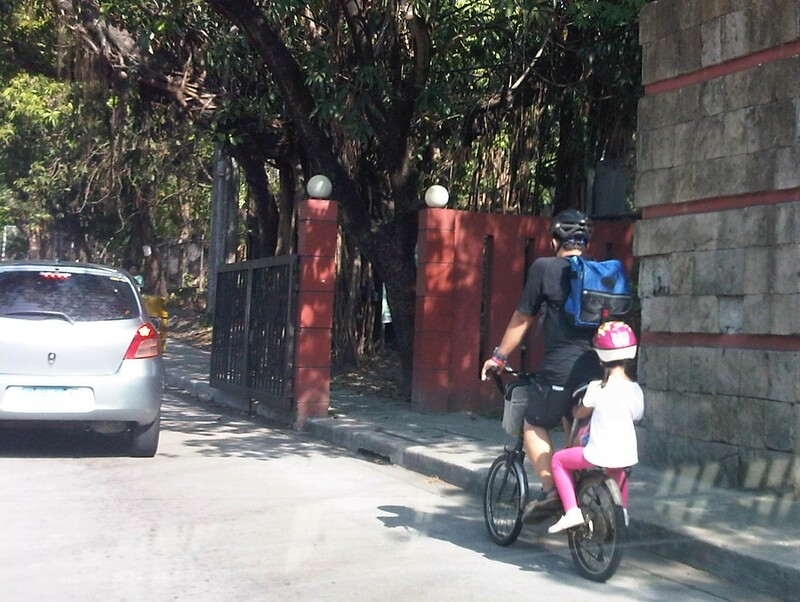 Pedalling along – after successfully crossing Katipunan, the father and daughter tandem finally enters the more friendly roads of the UP campus. UP Diliman already has bicycle lanes along its academic oval and the community is generally aware of the rights of pedestrians and cyclists as road users. I would like to think that people who have a connection with the University and those who are also advocates of walking, cycling and road safety respect each other’s rights. But as always there will be those irresponsible people (e.g., pasaway, barumbado, etc.) who will disregard traffic rules and put lives in danger with their behaviour on the road. In many cases these days, we just need a little common sense and perhaps more of courtesy to make travel safer and better for everyone. Everybody needs to learn and practice respect for each other’s rights on the road and courtesy extends to everyone so we can have order in our streets. It doesn’t take a genius (or experts, international or local) to point out things that are basically common sense and require common courtesy if not decency. By d0ctrine in Behavior, Cycling, NMT, Road Safety on May 5, 2014 .